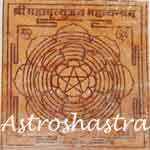 Mahamritunjay Yantra to free the fear of death, grave dangers, fatal diseases and makes him courageous and healthy. 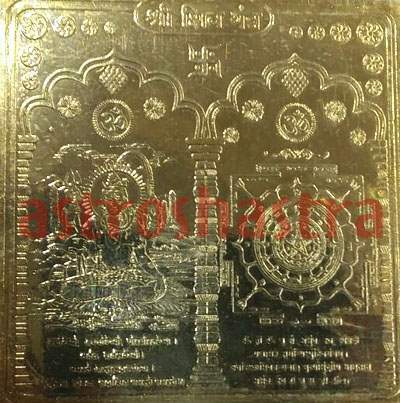 An outstanding yantra of great values, to be carried on silver or copper plate. The use and upasana of yantra is worship of Lord Shiva and is most auspicious and bestows the person with wealth, health and happiness, good fortune and fame. Each and every house hold shall place it in their homes. It is carved on copper plate with 24 caret Gold plating and is energised with mantras. The person who perform puja to it , remains in good health and free from all ailments. Mahadev is the winner of death. On worshiping Mahadev one can escape from miseries and troubles of this materialistic world as well as the problems related to inner soul. He eats our troubles, tensions, stress as well as our ego. Lord shiva is the doctor of soul and sentiments. It is useful when Saturn, Mars is enjoined, in opposition or in aspect to each other in a birthchart or in transit to avoid any accident or accidental death. 1. It dispels all sort of fears, influence of evil planets, fear of ghosts accidental death and disease etc. 2. It particularly releives one from all dreadful diseases. 3. It protect the place from evil eyes, spirits and ghosts. 4. It protects from accidents. This yantra is worshipped, also after pooja, the yantra be dipped in water and the water is to be drink as "Charnamrit" to control and cure diseases. The water sprinkled in the house creates amity comfort in home. 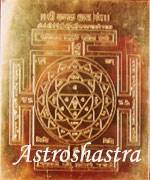 Astroshastra has made an effort to present it in silver pendant form also. This unique Protection Pendant is made to protect you form all odd. An energized silver mahamritunjay pendant can be worn by children, adults of any caste or religion. 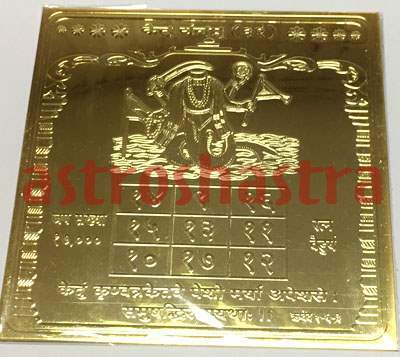 To avoid effects of bad souls and other calamities, this yantra, after pooja or being energised, is also fixed on the outer Gates of the house. It shall definately be worm by people who remain sick or are very prone to infections and diseases. It bestows the person with wealth, health and happiness, good fortune and fame. It dispels all sort of fears, influence of evil planets , fear of ghosts, accidental death and disease etc. The person who perform pooja of Mahamritunjay Yantra , remains in good health and free from all ailments.
" Om Hoorg joorg Om Bhoorbhava Swah, Om Tryamabakaam yajamaha Saugandhani Pushti Vardhamanm diyagona Parchodyet"
Maha mritunjay Puja -is done for a long and healthy life and to get rid of prolonged sickness.